I was recently reminded by a dear friend about a silly thing that we laughed about 21 years ago. She also explained to my daughter about a special group of friends that we were both part of who shared a special time. Those kinds of memories and friendships are timeless. They become the fabric of who we are and the memories only become more precious with time. I was taking a photography class at that time and shot a lot of black and white film with my old Konica TC. For this class I had borrowed my aunt’s Nikon F2 with a Nikkor 50mm F1.2 lens. 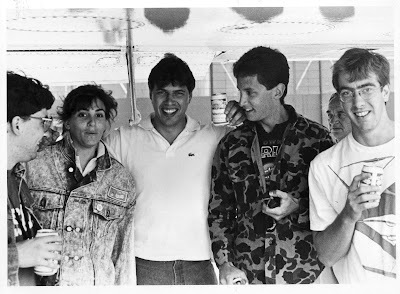 I took this b&w of the gang standing under the wing of an airplane at the Westchester County Air Show circa 1988. There was nothing posed about it. We were all seeking shelter from the rain. I jumped out in the rain and snapped this exposure. I gave everyone a copy of the print which I developed and enlarged in the college darkroom. Each one was truly a “one of a kind” because I was still experimenting with darkroom techniques like dodging and burning, different exposure times, gels, etc… Each one was an experiment. My favorite “walk around” lens now is still a Nikkor 50mm f1.4 on my Nikon D70 or D90. Only this one is autofocus with all of the through the lens wizardry that Nikon has developed over the years and the metal parts are now mostly plastic. So, it weighs a good bit less than the old metal tank. To be fair, a 50mm lens on a modern crop sensor makes it act more like a telephoto lens, say a 70mm equivalent. My daughter has her own “posy.” A couple of years ago one of the posy friends was moving away and the rest of the group had grown very close together and wanted to give her something to remember them by. They decided to have a group portrait done. The friend was moving to Ohio, so I chose a background that would inspire thoughts of Texas and something that they would as a group immediately identify. The fountain at the Town Square in Southlake, Texas was perfect. The fountain and Town Hall in the background are both beautiful but the architecture of the building to me was very Texan. More importantly, the Town Square was also the latest teen hangout. It’s where all of the teenage kids come to go to the movies, do some shopping and generally hang out with their friends and be teenagers. Since this photo was taken, another of the girls has moved to Virginia. I’m fairly confident that this photo will someday be a treasure to her like the old photo of my friends is to me. She also takes quite a few shots on her own that Dad’s not privy to seeing. I hope that she keeps them safe.